WASHINGTON (JTA) – Sen. John McCain, who made human rights and Israel centerpieces of his advocacy for a robust U.S. influence across the planet, has died. The Arizona Republican died Saturday, August 25 at the family ranch in Sedona, Arizona, one day after declining further treatment for brain cancer. He was 81. Never-Trump Republicans and not a few Democrats during the campaign and presidency of Donald Trump have held up McCain as an avatar of what the Republican Party once was and still could be: the national security flagship ready to overcome partisan differences to advance U.S. interests. Indeed, the relationship that was perhaps most emblematic of his dedication to national security and bipartisanship was his close friendship with Joseph Lieberman, the Orthodox Jewish senator from Connecticut. McCain became in his final years the reluctant un-Trump. He was the hero who spent 1967-1973 in a Vietnamese jail for American POWs, when Trump was a swinging young businessman who won five deferments from service. McCain was the victim of torture who led advocacy against the practice, while Trump embraced it. McCain was the flag bearer for robust American interventionism abroad, while Trump counsels conciliation and isolationism. McCain was candid about his flaws while Trump seldom apologizes; McCain took long meetings and delved into detail, while Trump eschews particulars for the big picture; McCain forgave his enemies while Trump nurtures his enmities. The very same qualities that perhaps cost McCain the presidency helped make him a hero of the Jewish and pro-Israel communities. The robust interventionism that he insistently espoused, even as the chaos engendered by the war he championed in Iraq turned Americans off foreign adventures, included a fierce commitment to standing by Israel. And McCain’s willingness to reach across the aisle even to liberal Democrats, which likely kept some conservatives away from the polls, extended to the Jewish community, where he worked with human rights activists. McCain was a scion of a fighting family. His grandfather and father had graduated the U.S. Naval Academy in Annapolis, Maryland, and he did as well and was soon a combat pilot flying missions over Vietnam. His plane was shot down and he was captured in 1967. Upon his release in 1973, he remained in the Navy and eventually became its liaison to the Senate, which is where he became interested in politics. It was in that capacity that he first visited Israel in the late 1970s, and a scene at Ben Gurion Airport fused what were to become two overarching passions in his political career: Israel and human rights. McCain was accompanying Sen. Henry “Scoop” Jackson, D-Wash., who had spearheaded pressure on the Nixon and Ford administrations to squeeze the Soviet Union into allowing Jewish emigration. “I will never forget at the airport there was a crowd of people that were there to show their appreciation for Scoop, and he stopped some in the crowd and told us to stop so that he could greet Nathan Sharansky’s wife, and I will never forget that one as long as I live,” McCain said in a 2008 campaign interview with the Los Angeles Jewish Journal. Sharansky at the time was a Prisoner of Zion. McCain left the Navy in 1981 and went to work for his second wife’s father, who ran an Arizona beer distributorship. He won a race for the U.S. House of Representatives in 1982 and for the Senate in 1986, and since was re-elected to the Senate. 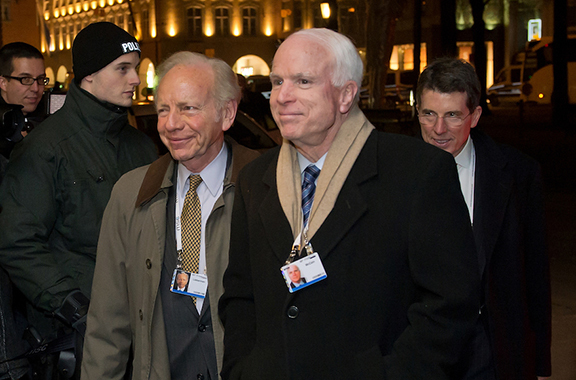 Two years later, Joe Lieberman joined him in that body and they soon formed a fast friendship. They traveled together countless times to Israel, and in the mid-2000s, Sen. Lindsey Graham, R-S.C., joined them on their overseas trips, to Israel and everywhere else where McCain determined the United States should make its strength known to allies and enemies. They were often photographed together – they called themselves “the Three Caballeros” – each grinning, wearing the senator-abroad uniform of a blazer and an open collar button-down shirt. 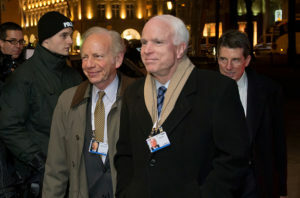 They seemed to have had a blast together, and McCain went deep blue at an Israeli Embassy reception in 2012 that honored Lieberman as he retired from the Senate. 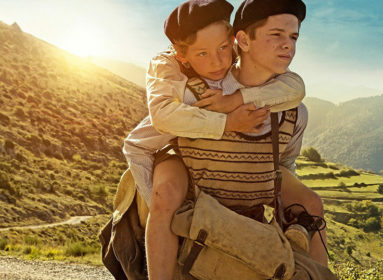 He described the alternating sensations of alarm and boredom that was the job of being a companion to an Orthodox Jew. “Why in every f***ing kosher menu do we have to have salmon?” he said. 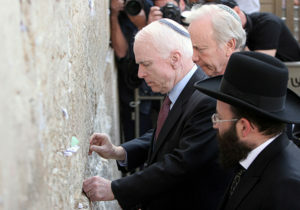 And then there was the time McCain fell asleep on a plane and woke up next to Lieberman davening in a tallit. “I hear this mumbling and I look and there’s this guy wearing a shawl – I thought maybe I’d died,” the Arizonan said. Lieberman by 2008 was no longer a Democrat but was still caucusing with the party. That didn’t stop him from endorsing his friend, and McCain thought seriously of repaying the compliment by naming Lieberman his running mate. The Republican establishment mightily resisted, saying Lieberman’s backing for reproductive rights would drive away conservatives, and McCain at the last minute chose Alaska Gov. Sarah Palin. It will never be known if Palin – who seemed callow and unprepared – cost McCain the presidency, but she appeared to have cost him Jewish votes. In polling before the pick, Obama was at 60 percent, low for a community that tends to vote for Democrats in the 70s. On Election Day, Obama garnered at least 74 percent of the Jewish vote. McCain’s willingness to buck his party was perhaps most pronounced in his outspokenness on torture, and that was an issue where he found common cause with liberal Jews. He had a long meeting with Rabbis for Human Rights (the group now known as T’ruah) in 2005 and it left an impression. The group briefed McCain on Israel’s High Court ban on torture in 1999 – and it subsequently became a talking point for him. He also joined with Jewish former Sen. Russ Feingold, D-Wis., in passing an act informally named for them that limited campaign giving. His party leader, Sen. Mitch McConnell, R-Ky., led one of the legal challenges to the law that culminated in its gutting by the Supreme Court in 2010. McCain had difficulty cultivating evangelical Christians – their support for George W. Bush in 2000 was a factor that kept McCain from winning the GOP nomination that year – but in 2008 he secured the endorsement of Pastor John Hagee, who founded Christians United for Israel. McCain dumped Hagee, however, after it was revealed that Hagee had espoused a theology that cast the Holocaust as a means of ingathering the Jews in Israel. His credo was forgiveness – seeking it from others and proffering it. Appearing with Obama at a 2008 faith forum, McCain said his Christian faith “means I’m saved and forgiven. Our faith encompasses not just America but the world.” In the 1980s and 1990s, he joined then-Sen. John Kerry, D-Mass., another Vietnam War veteran, in leading the normalization of relations with Vietnam. He was magnanimous to those who opposed the war at home as well. An anti-war activist, David Ifshin, traveled to Hanoi to speak out against the war, and his words were piped into McCain’s cell. Years later Ifshin, who had become a lawyer with AIPAC and came to appreciate a robust U.S. military posture, sought out McCain for his forgiveness. Ifshin died of cancer in 1996, and McCain spoke at his funeral.